This privately owned museum was established in 1956 and provides a very special view and understanding of the wildlife native to Montana. 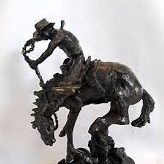 The museum is now a tribute to Bob Scriver, known as “The Cowboy’s National Sculptor.” He passed on in 1999, leaving a legacy of work that earned national recognition and honor. The Hall of Bronze houses Scriver’s bronze creations, depicting the wildlife of Montana, early Americans, cowboys, Blackfeet Indians and major sculptures of famous people. Scriver lived in Browning, and here is the most complete collection of his work. Bob Scriver started as a taxidermist, and his superb knowledge of the mountain animals shows not only in his taxidermy but also in the sculptures that followed. There are over 1,000 works in the museum, grouped by theme. Taxidermied animals include a grizzly and black bear, moose, wolf, buffalo, and antelope—creatures of the mountains and the plains that surround Browning. In addition to Scriver’s bronzes and taxidermied pieces, the museum also showcases Scriver’s books, including the Rodeo series and No More Buffalo, which focuses on Indian themes. He has been called the “foremost sculptor in America today—bar none” (Dr. Harold McCracken, Director Emeritus, Whitney Gallery of Western Art, Cody, Wyoming). His bronzes of cowboys at work, Indians on the high plains, or animals such as bighorn sheep seem to freeze in time the essence of the frontier, and they are found in museums throughout the West. Don’t miss a chance to visit this treasure. It is open from Mother’s Day to the late fall. There is a nominal admission charge.